National Historic Landmarks: CPRR, UPRR, Sacramento, Big Four House, Stanford House, Donner Camp, Frank Norris Cabin, Dodge House. California State Registered Historical Landmarks in Placer County, California, and in Nevada County, California. All Landmarks in Placer County. Nevada's Historical Markers in Washoe, Pershing, Lander, Eureka, and Elko Counties, Nevada. National Landmark information from the National Park Service [Search]. California plaques transcribed by Donald Laird, and the Calfornia Resources Agency. Nevada landmark information from the Nevada Divison of Water Planning. "The preserved portions of the transcontinental railroad bed throughout the Promontory area have been designated as a National Historic Civil Engineering Landmark. Many have argued that the transcontinental railroad was the greatest engineering feat of the nineteenth century. This plaque was placed by the American Society of Civil Engineers in 1969 as part of the commemorative celebration of the 100th anniversary of the completion of the world's first transcontinental railroad." "Central Pacific graders reached Junction, now Roseville, November 29, 1863, crossing the line of the California Central, which began building northward from Folsom in May, 1858. That line was abandoned in 1868, when trains began making daily runs 18 miles to and from Sacramento. Now Roseville is a major railroad distribution center." "Central Pacific reached Rocklin, 22 miles from its Sacramento terminus, in May, 1864 when the railroad established a major locomotive terminal here. Trains moving over the Sierra were generally cut in two sections at this point, in order to ascend the grade. The first CP freight movement was three carloads of Rocklin granite, pulled by the engine "Governor Stanford." The terminal was moved to Roseville April 18, 1908." "Regular freight and passenger trains began operating over the first 31 miles of Central Pacific's line to Newcastle June 10, 1864, when political opposition and lack of money stopped further construction during that mild winter. Construction was resumed in April, 1865." "After an eleven-month delay due to political opposition and lack of money, Central Pacific tracks reached Auburn May 13, 1865, and regular service began. Government loans became available when the railroad completed its first 40 miles, four miles east of here. With new funds, Central Pacific augmented its forces with the first Chinese laborers and work began again in earnest." 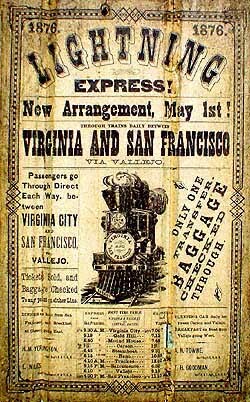 "Central Pacific rails reached Colfax, formerly Illinoistown, September 1, 1865, and train service began four days later. Colfax was a vital construction supply depot and junction point for stage lines for ten months. It was renamed by Governor Stanford in honor of Schuyler Colfax, Speaker of the House of Representatives and later Ulysses S. Grant's vice president. The real assault on the Sierra began here." "While construction on Sierra tunnels delayed Central Pacific, advance forces at Truckee began building forty miles of track east and west of Truckee moving all supplies by wagon and sled. Summit Tunnel was opened in December, 1867. The line reached Truckee April 3, 1868, and the Sierra was conquered. Rails reached Reno June 19, and construction advanced eastward one mile daily toward the meeting with Union Pacific at Promontory May 10, 1869, to complete the first transcontinental railroad." "The construction of the San Joaquin River bridge completed the last link of the transcontinental railroad. Building had simultaneously proceeded from the Bay Area and Sacramento and met at the San Joaquin River. The first train crossed the bridge on September 8, 1869." "On January 12, 1864, President Abraham Lincoln decreed that where the Central Pacific Railroad crossed Arcade Creek the western base of the Sierra Nevada began. The hardships of railroad construction through mountains resulted in increased government subsidies; these funds gave the company impetus to finish the transcontinental railroad." "Founded in the spring of 1851 by Joseph and Charles Dornbach. From 1854 to 1882 it was noted for its rich hydraulic mines. In 1860 had the largest voting population in Placer County. Chinese inhabitants numbered about 2,000. Here Theodore Judah and Dr. D. W. Strong made the original subscriptions to build the first transcontinental railroad." "Gold was discovered near here by Claude Chana on May 16, 1848. First known as 'North Fork' or 'Woods Dry Diggins,' the settlement was given the name Auburn in the fall of 1849. It soon became an important mining town, trading post, and stage terminal, and also became the county seat of Sutter County in 1850 and of Placer County in 1851. It was destroyed by fires in 1855, 1859, and 1863." "The spring of 1845 saw the first covered wagons to surmount the Sierra Nevada mountains. They left this valley, ascended to the ridge and turned westward to Old Emigrant Gap. The wagons were lowered by ropes to the floor of Bear Valley. Hundreds followed, before, during, and after the gold rush. This was a hazardous portion of the overland emigrant trail." "Founded in 1854 by O. W. Hollenbeck and originally called Mountain Springs. Famed for its hydraulic mines which from 1865 to 1878 shipped $6,125,000.00 in gold. Five large water ditches passed through the town serving the mining companies which had to cease operations in 1882 when state law was passed prohibiting hydraulic mining." "On September 6, 1869 first transcontinental railroad train linking two great oceans, and consisting of twelve cars and three locomotives passed here on way to a wharf terminal west of here, a location now covered by lagoon for take-off trans-pacific planes, and within confines, present U.S. Naval Air Station. Original celebration held near this spot." "Founded in December 1846 by John A. Sutter, Jr., Sacramento was an outgrowth of Sutter's Fort established by his father, Captain John A. Sutter, in 1839. State Capital since 1854, it was a major distribution point during the gold rush, a commercial and agricultural center, and terminus for wagon train, stagecoach, riverboat, telegraph, Pony Express, and the first transcontinental railroad." "Built in 1852, the Big Four House was named after the 'big four' — Collis Huntington, Mark Hopkins, Leland Stanford, and Charles Crocker — who planned, financed, and built the Western end of America's first transcontinental railway. It was in this structure that the four made their offices while organizing the Central Pacific (California to Utah) section of the railway, and where subsequently they founded the Southern Pacific Railroad (to Southern California) in 1873." "Situated on the lower Sacramento River, the Sacramento's river port emerged in 1849-50 as the great interior distributing and transportation center for the Northern Mines in the Mother Lode country of the Sierra Nevada. A large number of buildings dating from the 1840s through 1870s remain in the original business district. caught by the Sierra snows. Despite the Donner tragedy, many emigrant trains to California, particularly from 1849 until 1852, traversed the Truckee route. In 1868, the Central Pacific Railroad followed the Truckee's course. From the 1920's to the 1950's, the surrounding meadows echoed to the heavy exhausts of the giant Southern Pacific, cab-ahead, articulated steam locomotives. During the same period, the primitive emigrant trail and the early toll roads were developed into the Lincoln and Victory Highways, and then into U.S. 40 and I-80, today's freeway." "The first Europeans in the Reno area—the Stevens-Murphy party—passed through the Truckee Meadows near Washo and Paiute Indian camping sites and winter villages and over Donner Pass in 1844. With increased travel by 1859, C.W. Fuller established "Fullers's Ferry," a small lodging house, ferry and bridge at the site which would become the center of Reno. M. C. Lake bought the property in 1863, and it became known as "Lake's Crossing." When officials of the newly built Central Pacific Railroad platted the town around the central plaza where the station stood, it was called "End of the Track." Chosen by railroad officials, the town's permanent name honors a slain Civil War officer, General Jesse Reno. Growth was rapid due to railroad activity and continued development of the nearby Comstock mines. Reno became the county seat in 1871, incorporated in 1876, but did not draw up a charter or hold elections until 1903. In 1906 the wife of a prominent U.S. industrialist came to Reno for a divorce. The resulting publicity started the city's divorce reputation. Tourism increased, and a new industry was established when gambling was legalized in 1931." "Soon after Chinese laborers graded this section during the summer of 1871, track gangs commenced laying rail south, reaching Steamboat Springs by late October. To celebrate the occasion, numerous residents rode an excursion train to Steamboat on Nov. 7. Nine months later Superintendent Henry M. Yerington drove the last spike a mile west of Carson City on Aug. 24, 1872, connecting Virginia City with Reno by rail. Although regularly scheduled passenger service didn't begin until Oct. 1, the first through train traversed the 52-mile route on Sept. 1, 1872 — the last steamed by here on May 31, 1950." "The Truckee River, seen below, runs from Lake Tahoe to Pyramid Lake. The river's first recorded discovery was by Captain John C. Frémont in January, 1844. He camped by its terminus at Pyramid, then followed it to the big bend at Wadsworth. Captain Frémont named the stream the Salmon-Trout River. At the end of his 1845 sojourn in Nevada, he followed it into the Sierra and crossed Donner Pass. Beginning with the Stephens-Murphy-Townsend Party in 1844, the Truckee River became a route for California emigrants until the advent of the Central Pacific Railroad in 1868-1869 brought the wagon train period to a close. After the Southern Pacific took over the railway in 1899 and relocated much of its Nevada alignment, the old Central Pacific roadbed between Sparks and Wadsworth was deeded to Washoe County in 1904 for road purposes. In 1917, this road became a portion of State Road 1, which in 1920 became the Nevada section of the Victory Highway. In 1925, when Federal Highway names were replaced by a numerical system, the Victory Highway became U.S. Highway 40. In 1958, after reconstruction, this route became the initial section of Interstate 80 across Nevada. The river provides water for Reno, Sparks, the Fallon agricultural area and Pyramid Lake." "From 1868 until 1884 the Central Pacific's Truckee Wadsworth division was located on this site. In 1882, work was started on a new site across the river, and by 1883 a new round house, shop, etc. were completed there. A fire on April 15, 1884, fanned by heavy wind, destroyed the remaining railroad buildings at this location, as well as the town; damage exceeded $100,000. Lack of an adequate water supply contributed to the extensive damage. Another fire in 1902 stimulated the plan to move to a new site. In 1904, division facilities in the town were moved to an entirely new location, which became Sparks, Nevada." "Sparks sprang into existence in 1903 as a new division point on the Southern Pacific Railroad. Engaged in straightening and realigning the old Central Pacific trackage across Nevada, the Southern Pacific Company moved its shops and headquarters bodily from Wadsworth to this location. Employees were assigned lots, and their houses were freighted to the new town. Sparks, originally known as Harriman, came into official existence in April, 1904. Later, in 1905, the city was incorporated by the State Legislature and named in honor of John Sparks, rancher and Governor of the State of Nevada. Sparks boasted one of the largest roundhouses in the world during the steam era. It was the western Nevada base for a vast stable of steam locomotives, particularly the famous cab-in-front articulated type (Mallets). These huge steamers hauled both freight and passengers over the steep grades of the Sierra between Roseville, California, and Sparks." "Soon after 1900, some 373 miles of the original Central Pacific (now Southern Pacific) line between Reno and Ogden, Utah, was rebuilt. The work involved shortening of the line in some places. One such change took Wadsworth (Nevada), a division terminal, off the main line. During the summer of 1904 the terminal was moved to this location, which became the town of Sparks. A huge 40-stall locomotive roundhouse was dismantled in 1959. Still standing are the machine and erecting shops. Had it not been for the railroad yards being moved here, the City of Sparks would not exist." "The West's first train robbery occurred near this site on the night of November 4, 1870. Five men, led by a stage robber, Sunday School superintendent John Chapman, boarded the Central Pacific Overland Express at Verdi, Nevada. Two took over the engine, one the express car, and two the rear platform. One-half mile east, the engine and express car were halted and cut free, then proceeded about five miles, where they were stopped by a barricade. Here the robbers forced the messenger to open up. Seizing $41,600 in gold coin, they rode off. The uncoupled cars coasted downgrade and met the engine. The train proceeded to Reno. After a two-state chase, all were caught, tried and convicted. About 90 per cent of the gold was recovered." "Modern Verdi came into being with the construction of the Central Pacific Railroad through Nevada in 1867-69. It became a major mill town and terminal for the shipment of ties and construction timbers, with a network of logging railways reaching into the timber north and west of here. In 1860, a log bridge was built across the Truckee River near where Verdi is now located. Known as O'Neil's Crossing, the site served as a stage stop during the 1860's on the heavily traveled Henness Pass turnpike and Toll Road and the Dutch flat and Donner Lake Road. In 1864, the Crystal Peak Company laid out a town on the site some two milesfrom Verdi's present location. The company owned mining and lumbering interests near the settlement which was then called Crystal Peak. Verdi remained an active lumbering center into the twentieth century due to the exertions of men like Oliver Lonkey of the Verdi Lumber Company. A disastrous fire in 1926, plus depletion of timber reserves, resulted in Verdi's decline." "This honors the heroism and hardihood of the thousands of Chinese who played a major role in the history of Nevada. From across the Pacific the Chinese came to California during the Gold Rush of 1849 and on to the mountains and deserts of this state where they built railroads, cut timber and performed countless humble tasks. Sizeable Chinese communities grew up here, in Virginia City and other towns. Their contribution to the progress of the state in its first century will be forever remembered by all Nevadans." famous hostelry. Between 1841 and 1867, 165,000 Americans traveled the California Emigrant Trail past here. In 1850 on the dreaded 40-Mile Desert southwest of present Lovelock, over 9,700 dead animals and 3,000 abandoned vehicles were counted." "The Federal Government historically has supported numerous surveys for the purpose of measuring the domain which extended, after 1848, to the Pacific. These surveys sought railway routes, military relationships, water transport and wagon roads. The survey activity was extended to all territories, but not to states. Nevada, in part, was the site of two notable surveys: Honey Lake to Fort Kearny wagon road, completed in 1860 by Captain Lander; and the route surveyed by Lieutenant Simpson, Camp Floyd to Genoa, in 1859. Military engineers engaged in this activity included Stansbury, Marcy, Whipple, Beale, Simpson and Lander. The name of Captain F. W. Lander stands out as a contributor to Nevada's history. He has been memorialized in the name of a prominent county. Nearby Simpson Park Mountains are named for Lieutenant Simpson." "Located in the tank-like depths of Palisade (12-Mile) Canyon, Palisade--first named Palisades--was surveyed and laid out by the Central Pacific Railroad in February, 1870. During the 1870's, it rivaled Elko and Carlin as a departure point on the Central Pacific for wagon, freight and stage lines to Mineral Hill, Eureka and Hamilton. In October, 1875, with completion of Eureka and Palisade Railroad, Palisade became the northern terminus and operating headquarters for this little 90-mile narrow gauge line stretching southward to Eureka. Between 1875 and 1930, the town was the principal transfer and shipping point on the Central Pacific (Southern Pacific) and on the Western Pacific Railroad after its 1910 completion. At its peak, the town boasted a population of 300. It was a self-contained community, and railroading was its business. There were passenger and freight stations, and sidings on both the Southern Pacific and Western Pacific Railroads, and a large ore transfer dock between the narrow gauge and standard gauge lines. All Eureka and Palisade (Eureka-Nevada after 1912) headquarter facilities were situated here. After the little narrow gauge line ran its last train in September, 1938, Palisade went into a long decline. The post office was finally closed in 1962." may yet be seen on the slopes above them and to the northwest. The City of Wells, first established as the water stop of Humboldt Wells on the Central Pacific Railroad in September, 1869, is named for these springs. Its name was shortened to Wells in 1873." "In December, 1828, Peter Skene Ogden and his trapping brigade (Hudson's Bay Company's Fifth Snake Country Expedition) were the first whites to enter here. Joseph Paul, one of Ogden's trappers, died nearby — the first white man to die and be buried in the Humboldt county. The Bidwell-Bartleson Party was the forerunner of the 1841-1870 California Emigrant Trail tide through the canyon — then known as Wall Defile or Frémont Canyon. Late in 1845, John Frémont dispatched his Kern-Talbot-Walker subsection down the Humboldt; they traversed this canyon with difficulty on November 10. In September, 1846, the Reed-Donner Party, enroute to cannibalism and death in the deep snows of the Sierra Nevada, viewed the canyon. The Central Pacific's Chinese track gangs constructed the railroad (now Southern Pacific) through here in December, 1868. Subsequently, the canyon became known as Carlin or Moleen Canyon. The Western Pacific, second transcontinental rail link across Nevada, was constructed in 1907. In 1913, Nevada Route 1, the first auto road, took over the abandoned (1903) C.P. grade through the canyon. In 1920, Route 1 became the Victory Highway, and in 1926, U.S. Highway 40. In its freeway phase, it is now designated Interstate 80." "On December 29, 1868, representatives of the Central Pacific Railroad started laying out lots for the future town of Elko. By 1870, the thriving town had 5,000 people. There was an immense volume of freight and passenger traffic over the stageline roads north and south from the railhead at Elko to the mining area. The University of Nevada was originally built in Elko in 1874 and remained here until 1885, at which time it was moved to Reno to its present location. By the early 1870's, Elko became the marketing and economic center for northeastern Nevada's vast range livestock empire. In the 1870's and 1880's, great ranching principalities were built on Elko County's vast rangelands. These ranches were ruled over, absolutely, by such powerful and colorful cattle kings as L. R. "Broadhorns" Bradley, Nevada's second Governor and its first 'cowboy' Governor; the French Garat family, Spanish Altubes, and John Sparks, Governor of Nevada in the early years of this century. Elko remains the economic hub of Nevada's greatest range area. At the same time, it has also become a recreation-tourism center in northeast Nevada." "Carlin, the oldest town in present Elko County, was established as a railroad division point in December, 1868, by the Central Pacific Railroad. It was named by Central Pacific officials after William Passmore Carlin, a Union officer who served his country with distinction during and after the Civil War. When the railroad construction crews reached the Carlin Meadows, always a favorite stopping place for wagon trains along the California Emigrant Trail, a townsite was laid out, and a large roundhouse and shops were erected. During the 1870's and early 1880's, Carlin competed actively with Elko, Palisade and Winnemucca for the staging and freighting business of the many mining camps north and south of the railroad. In 1965, it became the principal shipping point for the nearby Carlin gold mine, the second largest gold producer in the U.S. Carlin is still a principal division point on the Southern Pacific. During the period from 1906 until the early 1950's, Carlin was the principal icing station in Nevada for refrigerator cars on both the Southern and Western Pacific Railroads. (Western Pacific reached Carlin from the easterly in 1908, but through freight and passenger service was not inaugurated over this transcontinental line until 1910.)" "From 1869 until his death, this was the residence of Grenville M. Dodge (1831-1916), who as Chief Engineer supervised the completion in 1869 of the Union Pacific Railroad, part of the Nation's first continental railroad. His three story, 14 room Victorian mansion was considered one of the finest residences in Iowa at the time." Need similar information for other States' transcontinental railroad landmarks.